New Gods: With a new world, comes new gods. Some gods (especially for the non-human races) may remain unchanged. 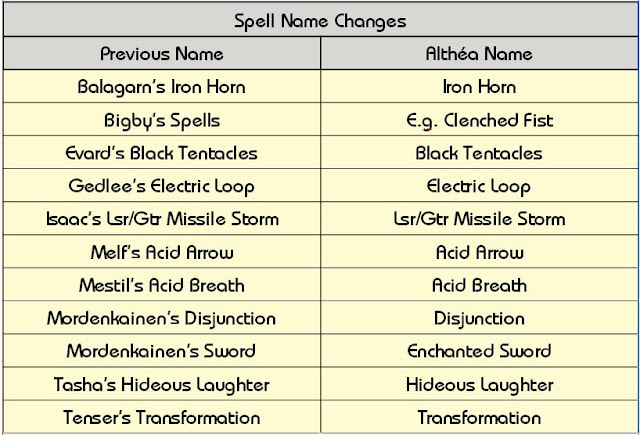 (They were kept as such within the Althéa Campaign.) However, all the human gods will be different - and subject to which god your PC has when they enter the world, they may find the god changed to one appropriate to Althéa, or have their deity name labeled as "Uncertain/Searching". If you are creating the PC from new, then you will be given a choice of valid gods from which to to choose. (See an example of some in the image below.) If the PC is imported, however, then a check is made to ensure no invalid faith enters the world. If you are playing a cleric, the game ensures you enter with a valid faith (rather than "Uncertain/Searching") and provides you with an appropriate holy book, which is required to learn spells when resting. MP Alignment Restrictions: If a MP game is already underway, then it is possible that the current party of players has already committed themselves to either a good or evil alignment. If this is the case, then the newly entering PC will have their alignment changed to that of the party, which may mean clerics being out of favour with their god and unable to pray for spells. 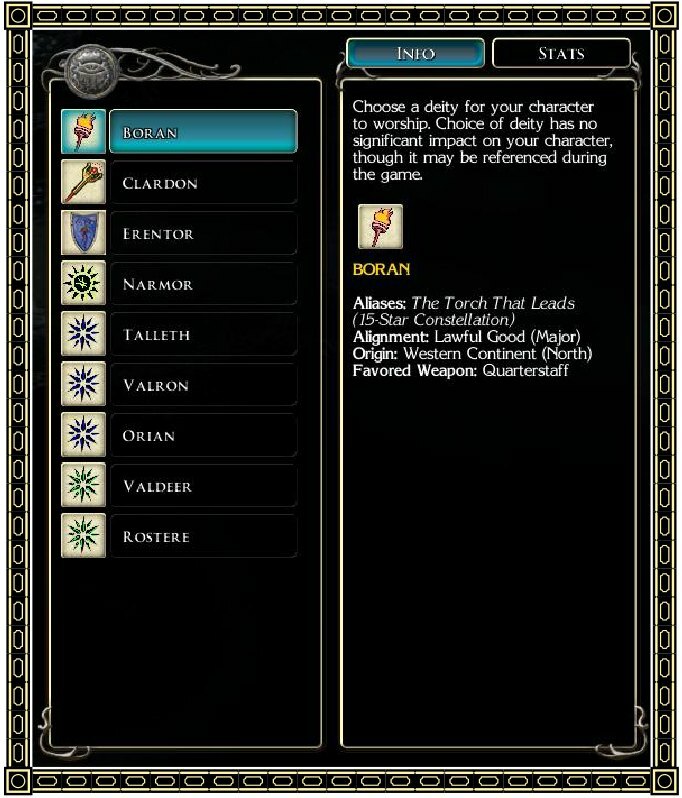 Therefore, make sure your PC’s alignment matches that of the party leader in a MP game to be sure of having access to spells. You raise an important point here, but I want to clarify and ask if you are taking it far enough? For instance, my wife and I do not follow any tradition that has ties to Pagan/Romish background. If you avoid all such traditions (supposedly called "Christian") then you will automatically not find yourself mixing alongside those like those you mention in your blog post. To clarify, my wife and I celebrate the birth, death and resurrection of Jesus Christ our Lord every day! We do not recognise man-made ceremonies called "Christmas", "Easter" or "Good Friday", etc. We believe the bible alone tells us what is required in worship, and we have the models of the Apostles, of which we read in the bible. So, the point is: Keep ones self holy unto the Lord and avoid worldly will-worship of men. Love the brethren in Christ and the doctrines of the bible and one will automatically demonstrate a difference between beliefs by their fruit (including style of worship). So, to clarify your stand, do you "celebrate" these man-made events like the one you are referring to called "Good Friday", or are you saying that you also avoid them? I also note that you adress a point against the idea that "once saved, always saved", and quote Scriptures to suggest your stand. However, this would also imply that you deny the "elect" in Christ. Is this the case? For instance, there are *many* references in the Scriptures that demonstrate that the chosen/elect or "saved" are known even before the foundation of the world. Therefore, to suggest that any man has any say in their election/salvation is impossible. However, you will know who is saved/elect because they believe that Jesus Christ died for their sins - as the first of many fruits that will follow with santification as they grow in Jesus Christ. Another clear reference to such differences between the saved and the unsaved are when the bible speaks of the "sheep" and the "goats". There are differences among people. The "sheep" will hear Christ and obey, whereas the goats will not. Therefore, the text from Scriptures that you use is taken out of context with the rest of the bible. And while I can agree that there may be some people who will hear the word and "believe" it for a while and then fall away, it is NOT the same as a believer who hears the word and believes, and can thereafter NEVER lose their salvation! No one can take the ones chosen by God from Christ! That is a promise from our Saviour! 1) If anybody wishes to speak with me about Christian matters, they can email me directly and I will try to repond as soon as I am able. 2) I do not want this blog "hijacked" by posts that do not relate to the topic at hand. 3) I do not want to imply that I agree with all posters that invite me to their blogs, and as such, do not want to convey a condoning of what could be a false prophet. I also believe that God can use somebody in whatever they are doing to reach people in His own way. Note: I am very much open for discussion, but not at the expense of driving people away with topics that they may not wish to discuss at this time. Many followers of this blog know I am a Christian, and I have had some interesting discussions about my faith with them through it. I do not wish to mislead readers about my faith through further discussion without them being involved in such discussions. So, if any others posters wish to invite me to read their blog, please contact me directly by email and I will consider it. The illegal classes, will you be setting them as non-player classes in the 2das so they won't appear at all. This would limit your need to filter them out. In my opinion removing aspects of the game that are not supported or will "break" your environment may be the best way to approach this. The only issue would be if a player tried to bring in a pre-made character, and the game would crash. But an explanation in the game manual should solve that. That is, I have disallowed them via 2da editing and I have done On Enter checks that check players using existing ones. And I have pre-warned via the manual. Thanks for double checking with me though, as that is exactly the sort of thing I need to know. I don't want to assume I have done it all.